The X1 'day' largely depends on your location. Over here in the west, for example, my daily routine begins with a viewing of K2 & Y6 at Walpole Highway, normally during a pause in my journey to work outside Bruce's bungalow. K2 is due at the Highway at 08.31 and often runs slightly early. This morning it was dead on cue with 37568 and one of the village regulars was caught out, however, the driver kindly stopped for him even though he was well short of the bus stop. Westbound, Y6 is the first service from the coast, all previous ones having started at Lynn. Surprisingly, in view of the distance it has to travel, this is also a pretty good timekeeper and delays of more than 5 minutes are very rare. Today 37573 passed us 3 minutes late, but the clear path into Wisbech now that the schools traffic has finished meant it managed to be a minute ahead of schedule departing for Peterborough via the correct route down Nene Quay. Unfortunately the punctuality described was misleading, as overall things were quite tardy today. Viewed during the morning from my work were 37563 on Y9 right time and later 37572 17 late on L12. The intervening services took the A1101 route to Weasenham Lane and Bruce reports 37564 on Y7, 37574 on L8, 37566 on L11 and later 37570 on Y13. 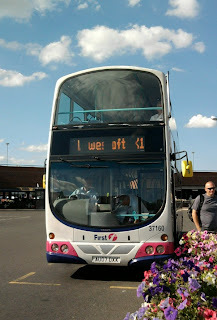 The latter was only 5 late from Wisbech on the 13.56 to Lowestoft. L10 was not seen, but turned out to be 20127. The afternoon began Ok with 37160 on K18 being the worst performer, seen by Bruce heading west 18 late. Coach 20126 was in charge of K1 and this was about 10 late. An A47 incident is believed to have caused some delays at teatime. K4 with one of King's Lynn's best drivers managed to be 29 late through Walpole at 17.32 with 37577. Meanwhile, poor old 20127 expired at Hopton-on-Sea working the 16.25 from Lowestoft with a steering issue. 37157 which was in the area heading for Lowestoft on K14 was turned around and went back west in place of 127, but not before L11 had overtaken it with 37566. 157 was noted arriving at Lynn at 20.38 with 'not in service' showing, hardly surprising as it was an hour late. In contrast 37573 on Y6 was viewed leaving Vancouver Avenue garage after a top up at 20.35, about 5 minutes ahead of schedule. Because of the failure of L10, 37564 off Y7 was started up to work instead and this eventually left King's Lynn for Peterborough 26 minutes late at 20.16. At least though this did run, whereas L12 20.50 to Peterborough was cancelled despite 37572 only arriving about 10 minutes late. You may recall that on Tuesday we reported the appearance of 20127 on L12, and Syd confirms that it was a replacement. 20107 (The Beast) was due to work L12 but it was unable to do so after being hit by an Anglian bus in Lowestoft bus station (perhaps 107s fame is unpopular !). 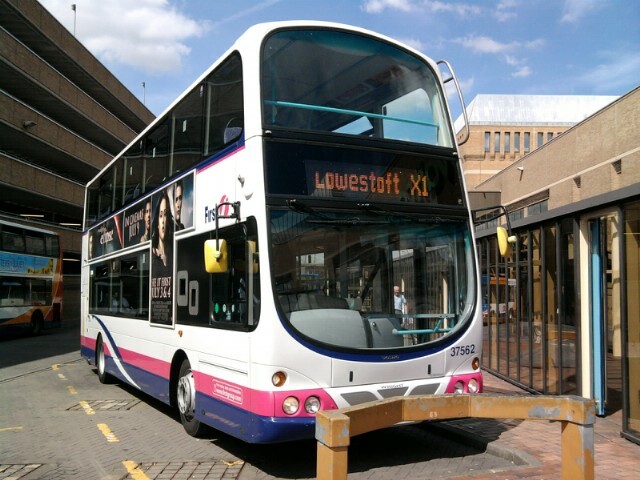 In what is believed to be an unprecedented case, the passengers AND driver of 107 travelled on the next Service 1 to Great Yarmouth where 20127 was ready to work forward, there being no bus available at Lowestoft to deputise. 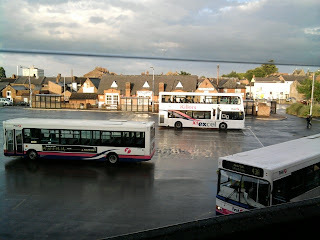 20126 departs Wisbech Horsefair bus station ten minutes late as the 13.56 to Lowestoft today. 20127 against a thundery sky this evening at Fence Bank. It was running 14 late on the 17.05 Peterborough - Lowestoft. 20107, aka 'The Beast' seems to be stopped for servicing at the moment and as we reported yesterday 20127 stepped into the breach to provide cover for L12 yesterday. Today it worked K2 which terminates at Lowestoft after working the 17.05 from Peterborough. Bruce nearly fell off his chair at the observatory at lunchtime however. 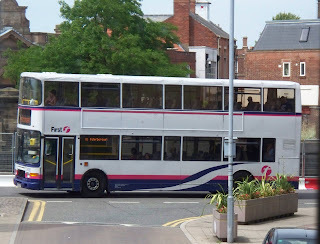 Having smugly announced that Y13 should be 37567, I was taken down a peg or two when Bruce phoned to say that in fact it was the other Great Yarmouth coach, 20126 ! Running 16 late to Peterborough, it had reduced this to 10 minutes on its return and it duly completed the turn which forms the last service west of Lynn finishing as the 23.10 from Peterborough, by which time it had regained all the lost time. 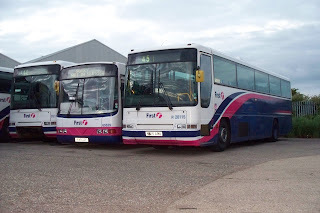 One has to go back to 23rd April 2009 to find the last occasion when both Yarmouth B10Ms were working the mainstream X1 - well I know you expect me to know sad facts like that ! On the Gemini front 37577 & 37156 were no shows out of Lowestoft today, but 37563/8 appeared instead. Only two B7 Geminis were on the X1 service, which is very unusual of late. These were 37157 on L12 and 37160 on K5. Normally B7 turns, K18 had 37570 and Y13 as we've already said 20126. 37568 is operating in a rather unusual condition this week. Firstly the rear route indicator is out of use - 37567 has of course been like this for an age and a B7, can't recall which but either 37156 or 37157 is likewise now. 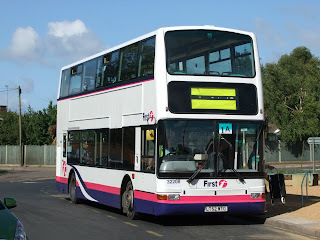 568 is unique though in having just a single advert (for Lynx on the offside) with both nearside and rear panels clear. 37576 also exhibits the original route destinations on the nearside and was on K15 today running 13 late on the 12.45 Lynn - Peterborough, this was an improvement on the 23 minute deficit it had accumulated on the same turn yesterday. 37565 appears to have been cured of its noisy fan and reports on 37156/7 will follow in this respect. B10M coach 20127 presents a novel, if somewhat unloved appearance these days. Here she arrives at King's Lynn at 20.35 this evening before working the 20.50 service to Peterborough (L12). A complete low floor service these days relies on 19 Geminis being available out of a pool of 22. Quite a high availability is therefore required and with King's Lynn now running short of possible replacements, anything is possible. The regular back up has been 34108 and 20107 of course, with 20126/7 and 60863 as a last resort. I think the King's Lynn Scanias need their tachos recalibrating if they are to see occasional X1 use. 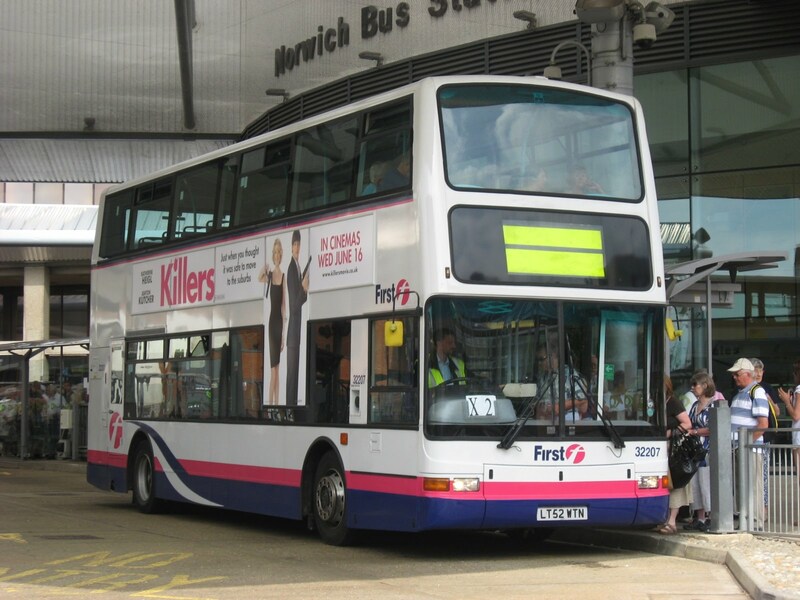 Today a request seems to have been made from Lowestoft for help and Yarmouth answered with barbie pink liveried 20127 provided for L12. 20107 and 37563 or 37568 should have been available, but unless one of these worked the turn to Yarmouth, 20127 must have worked throughout. 37568 was made available (apparently off MOT) to work the second part of Y6, this having arrived at Lowestoft with 37157. At King's Lynn this evening, Vancouver Avenue garage revealed 37158 with a broken window and 37159 with wheel scotches after being serviced, both viewed from the road. 37570 is believed to have been on the pits after working K3 but was not completely visible for confirmation. Having been in Edinburgh last week, I noticed the majority of their buses had adverts for BT low line rental and a new Lynx deodorant. Both adverts are now showing on the Gemini fleet here too. 37562 was obviously used on Sunday again and today it returned from the coast on Y7, but a swap at Lowestoft saw it come back this evening as L10. Earlier 20107 had been on L10 but this was then rested. 37579 on Y13 13.05 from Peterborough is due back into King's Lynn at 21.43 after the trip to Lowestoft, but somehow tonight it was in Lynn bus station at 19.55. It is not known what did Y13 forward from Lynn at 14.33, but tonight 37156 off K14 appeared on Y13. 37563 and 37568 were once again absent from the X1 and reliability seems to becoming an issue with several of the Lowestoft B9s. Punctuality was fair today. Noted on Nene Quay just after leaving Wisbech bus station were 20107 on L10, 37569 on L11 seen 7 minutes late, 37574 on K17 two minutes early and 37157 on K18 just 2 late. 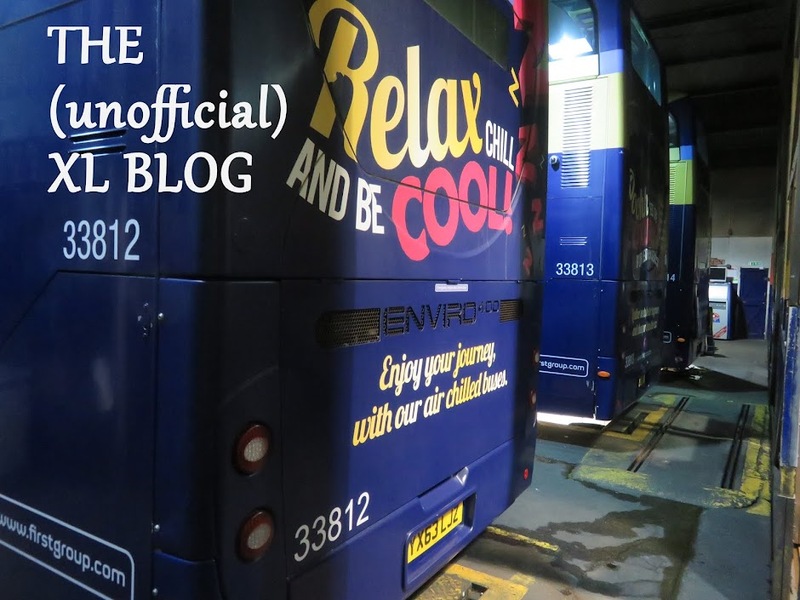 Just when you thought the blog had died, up it springs again ! Bruce Billingham and Rob Brooks kept me informed of events in my absence north of the Border. Wednesday Y7, Thursday K4, Friday Y13 and Saturday K16. Gemini wise 37568 looks to have been enjoying yet another spell out of service, last seen on 20th on K14 and it was then due for a safety service. Punctuality was poor in places, Thursday afternoon saw K15 with 37574 18 down on the 14.05 ex Peterborough with K16 behind it 16 late (37573). Later K19 passed eastbound with 37575 26 late. Friday afternoon included L12 14 late with 37566 and the Beast 20 late on Y13. K14 with 37575 was 9 late to Peterborough, but 17 late returning. K16 with 37569 was 15 late and 37157 on K18 10 late. Saturday was better for timekeeping and worst offender was 37156 seen by Rob arriving at Peterborough 8 late and still 'very noisy !'. The temperature shot up this afternoon and although the average seemed to be around 27.5', at one stage my car recorded 34 ! Probably quite unconnected, but the X1 had its overall poorest day of punctuality for some time. Services from the coast passed Bruce as follows this morning / afternoon. L12 37562 10 late, Y13 37564 16 late, K14 37568 16 late (but reduced to just 8 late when seen returning), K15 37574 17 late, K16 37577 16 late and K17 37573 21 late. Later on K18 with 37579 was seen coming through on the 15.35 from Peterborough bang on time, but then 37570 on K19 was 19 late. Whether 37579 was turned round at Wisbech rather than going through to Peterborough is not known. Going west at this time were 37569 on K1 18 late and 37563 on K 2 10 late. K3 was then 37160 11 late, K4 The Beast about 12 late and K5 37158 27 late ! 37567 did the first part of L8 and then dropped down to Y9. L8 then came back with the errant 37566, however, on the 20.05 from Peterborough it went like a demon and was 4 early at Terrington and reached the Pullover roundabout in just 8 minutes from Walpole ! 37156 was the bus taken off Y9 at Lowestoft. 37574 was removed from K15 this afternoon and the 15.33 to Lowestoft left Lynn with freshly serviced 37572. Peter went on one of his jaunts today, as he put it, to visit the Peoples Republic of South Yorkshire. He started his day on Y6 which this morning was unusually 37562. 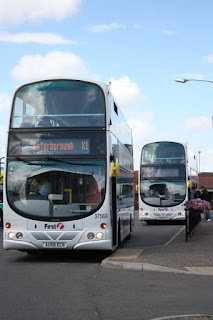 The 49mph handicap had little effect though and Peter says it was the earliest he'd ever arrived at Peterborough on Y6, no doubt helped by it taking the correct route out of Wisbech. 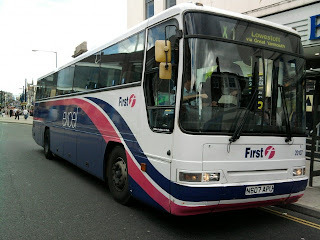 562 stuck on Y6 all day taking it to Lowestoft this evening. Other X1s seen on Nene Quay were 37563 on L10 and later three in a row, 37577 on K17, 37156 on K18 one minute early and 37574 on K19 6 minutes late. 37565 was delayed on K4 this morning and passed Bruce heading to Lowestoft 24 minutes late at 09.59. K5 following was 11 late with 37570. Y9 had the delights of 20107 today, but 37579 on L11 was a 'no show' going to Peterborough and was then on time coming back. It is believed that all diagrams stuck with their allocated vehicles today. 37566/7 were B9 Gemini absentees. Sunday 18th July 2010 ~ Will the real 20114 stand up ? A very uneventful day on the X1 it would seem. The 13.22 Wisbech to Peterborough with 37578 was 13 late and the only other thing of note was 37562 out on a Sunday for the third week in a row. It worked the 10.10 Peterborough - Lowestoft and then went empty to Yarmouth. Jamie Vendy spotted this old favourite in Cambridge yesterday afternoon, yes the former 20114 was back in East Anglia with Farleigh. 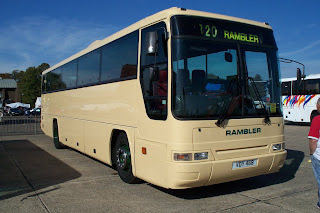 Now I was told that this rather smart B10M at Showbus was in fact 20114, so has it moved on from Rambler and reacquired its original registration in the process ? The Beast photographed by Des on Friday afternoon, while working L10 15.30 Yarmouth to Lowestoft. 37568 photographed at Swaffham last year by Jim Long from the upper deck of 37567. I decided to visit the North Norfolk railway's beer festival at Sheringham today. En route to Norwich in the car I passed several westbound services viz : 37564 on L9 at Terrington St. John, 37156 on Y10 near the South Gates, 37573 at Hardwick on L11, 37565 between Swaffham and Narborough on L12 and 37157 on Y13 near Dereham. Just in front of me was 20107 on K1. Last night 37573 on K15 was swapped at Lowestoft for 37579 off K16 and this returned to Lynn. Lately Friday timekeeping has been pretty good overall, but today things went pear shaped. Here in the west the worst time was mid afternoon. Y13 with 37160 was a respectable 8 late on the 13.56 Wisbech to Lowestoft, but K14 with 37567 was seen by Bruce already 20 late going eastbound. K15 with 37573 was viewed 48 late through Walpole Highway en route to Lowestoft and K17 with 37575 was 21 late heading east. K18 with 37157 managed a 20 minute deficit, but things then gradually improved eastbound. Meanwhile 37158 on K3 was seen just 3 late on the 08.56 Wisbech to Lowestoft, but returning tonight was no less than 28 late. 37574 following on K4 was a mere 5 late, so Peterborough bound services left Wisbech at 17.16 and 17.20. 37566 is reported as being under repair at Yarmouth, so with 37565 being examined today, 'The Beast' made another sortie out on the X1 working L10 and thus successfully thwarting a complete low floor service. Confirmation today that the three Hunstanton schools contracts have gone over to whatever vehicles are available, following an opt out clause in the contract with NCC over mandatory seatbelts. 20118 will therefore work no more, although there is still an outside possibility that 20123 will be re-engined. Jamie Vendy was on hand to capture 37569 on K1 and behind it 37568 on K14 at King's Lynn bus station at just after 3pm today. 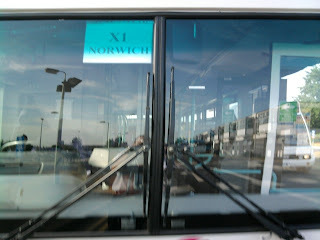 Hope the link works, if so you'll see a picture of 20129 with the marvellous caption 'A Norfolk Bus'. Perhaps a more up to date caption should read ' A Norfolk Driver Training Coach Recently withdrawn' ! 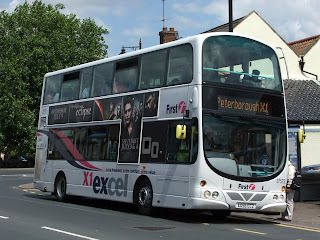 X1 duties seen today included K2 with 37565 which was 3 late at Walpole Highway this morning making a horrendous racket - the fan problem being the reason and this is the first to suffer with this for quite a while. 37563/6/7/70 having already been cured. Bruce saw 37158 on K3 and Ian reported 37575 on K5. Y7 with 37564 and L8 with 37156 both passed my office for a change and both on time, however, this did not set a precedent and the next bus I saw was noisy old 37565 nearly 7 hours later on the 16.18 Wisbech to Peterborough. It had regained the 3 minutes of lost time reported earlier though. Punctuality this afternoon was on the whole pretty poor. 37579 on K15 12.45 King's Lynn - Peterborough was seen 13 late, 37562 on K17 (as usual) managed to be on time but Bruce saw K18 with 37160 returning east 15 late at 16.50 through Walpole. Cheryl then saw 37578 on K19 arriving in Wisbech a similar 15 minutes behind schedule. On the bright side, there didn't seem to be any swaps of vehicle allocations today, which Heaven knows is very rare. 37566 was absent yet again and this seems to be the lame duck of the B9s. 37576 spent the day at Vancouver Avenue and was rumoured to be attended to by Volvo staff. 37159 was again on Lynn 7110 turn which it has done since Tuesday and 'The Beast' was for a change employed on an X2 turn which also does afternoon school contract 7 in the Beccles area. Thundery showers and rainbows were the order of the evening at King's Lynn tonight. 37578 off L11 stands to the right of 37158 which had come in on K3 and by this time should have been washed and put to bed for the night. Photo D Speed. Here's 37160 photographed by Grahame Bessey today on K5 at Norwich bus station. I can't recall seeing a single X1 service taking the Nene Quay route out of Wisbech from my work today. Just when I thought the day would pass without such an event,I found myself quite by chance following 37568 down the Quay on L10 tonight. I have to admit that at one point the clearance is a little tight, but no more so than the South Gates at Lynn which have to be negotiated on a daily basis. Come on you X1 drivers, we don't want you getting a reputation for being less than the excellent chauffeurs you actually are ! Now briefly going back to yesterday and a correction to begin with. 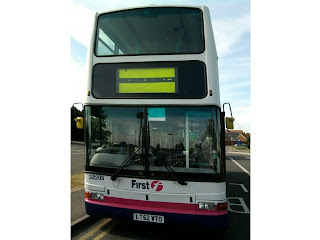 The reason 37578 was removed from K15 was not because of screen damage, in fact it failed at Swaffham with power loss. Today it was given a test run and then replaced 37579 on L11 for the 13.32 to Lowestoft. 579 wasn't out of action for long though as 37576 failed at Wisbech on K15 14.05 from Peterborough - again with a loss of power and 579 replaced it from Lynn on the 15.32 to Lowestoft. The Beast (20107) was surprisingly on Y6 this morning, but on arrival at Lowestoft was changed for the infinitely less appealing 37156. This B7 had begun the day on K1 but 37572 was substituted for it on the 11.55 ex Lowestoft. 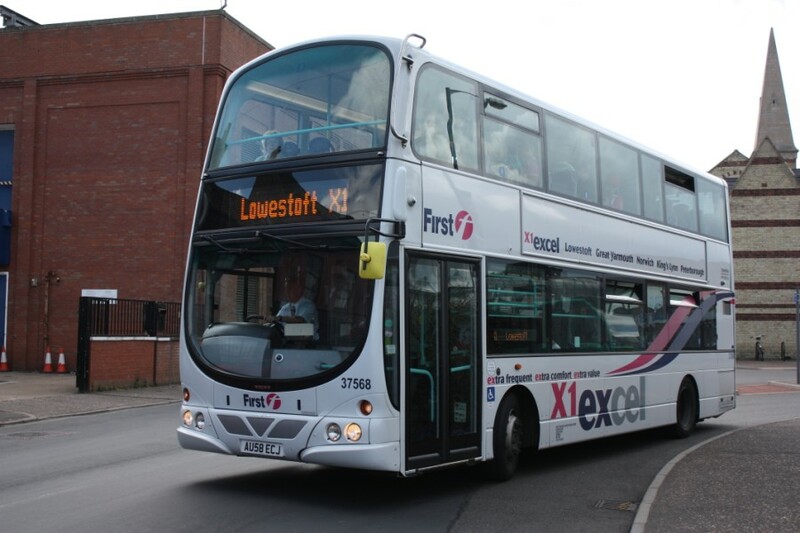 37566 did the first part of K1 yesterday but then went on to an X2 turn which involves a school contract. 566 did not appear today, but all the B7s save 37159 did. 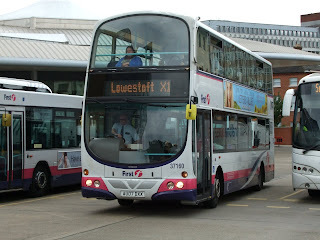 The latter was on Lynn local 7110 diagram which is booked for a B7. This chap is practicing for next years Tour De France (OK we all know he's on Gorleston seafront). The photo is included as his bike goes marginally faster than 37562 ! Des says ' I haven't quite got the hang of this taking pictures of moving buses yet, hence the above. Still, thought you'd like to see what 37568 was up to this evening. 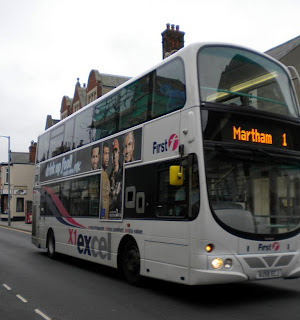 It was snapped in Gorleston High Street at 18.48 and would have been the 18.10 ex Lowestoft to Martham, will it also operate the 21.13 to Martham? The withdrawal of the King's Lynn B10M fleet means that back up for the X1 is now in short supply. Today was a good test for Richard & Co. K15 had a problem when 37578 sustained a smashed window , so 37158 replaced it at lunchtime. Later on 37564 on Y6 was also in trouble with a recurrence of its old problem, an ABS fault and 37572 was seen on this duty at 20.30. As this had begun the day on K18, it looks as though it only worked on this turn from Lynn to Lowestoft and then took over Y7 (from 37565). With this being the first terminating turn, 572 then took over Y6 departing later than advertised. The Beast worked K4 all day and there was still room for 37563/8 to have a day off for maintenance at Lowestoft, however, it would seem that 37563 may have done the second leg of K18. 37156 & 37567 were sent out from Lowestoft this morning instead of 37563/8. 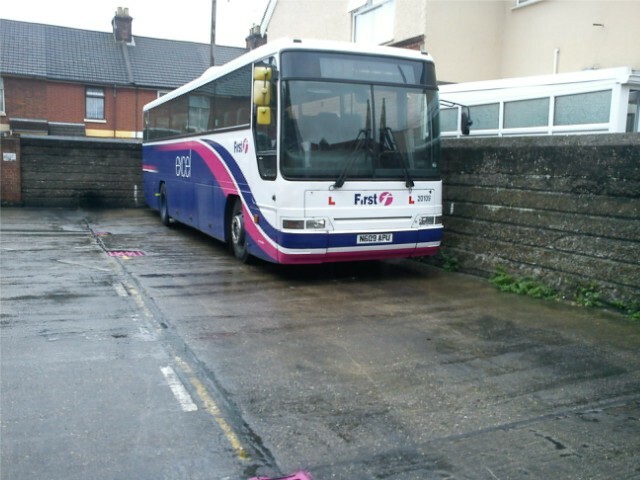 20109 with the tell tale L plates awaits its first driver for training at Yarmouth today. So that's what they wanted it for ! 20121 at Great Yarmouth where it is due to be converted for driver training duties in Norwich. Photos by A Regular. Today I was sent pictures (see above) of not only 20109 which is to become Great Yarmouth's driver trainer, but also 20121 which is being converted there also but for use at Norwich. Good of King's Lynn to make sure they were freshly MOTd before departure ! Meanwhile 20107 continues unabated as if nothing had happened and it now presents a strange sight amid the sea of Geminis. Tonight it sat on the concourse at Vancouver Avenue having completed Y9. Absentees today were 37156 and 37567 and at the Lynn end 37158 used locally on diagram 7110 with 37160 receiving a safety service. 37562 worked Y7 after being sent over to Yarmouth yesterday and this is quite a common occurrence on Sunday/Monday. It was in the process of having an advert for the film 'Eclipse' replaced by a similar one for 'Rebound' this evening. With 37562 otherwise engaged, K17 was 37578 today, seen here on Nene Quay in Wisbech. Note the fire damaged property on the right, work of the now tamed Wisbech arsonist. I seem to recognise 578s driver from somewhere ? Now here's a better shot of 578 showing more demolition work in progress, this time at Peterborough rail station. Photo by Des. The Beast didn't work on the X1 today but was usefully employed a s a staff shuttle between Norwich and Great Yarmouth. Des took this picture in the sunshine at Norwich. A low floor line up at King's Lynn this evening with 37575 nearest the camera getting a rare day off. 37573 with its untidy advert for EasyJet has a rest from X1 duty at the East Anglian Transport Museum. I decided to visit the East Anglian Transport Museum's gala at Carlton Colville today. I was otherwise engaged until lunchtime, but decided to leave here at 13.00. I thought I might see a couple of X1s en route and 37578 was seen approaching Terrington a couple of minutes late with the 09.48 from Lowestoft. Next seen was 37576 leaving Narborough on the 10.48 from Lowestoft. I hadn't expected to see any more, but 37570 was noted departing Hockering on the 11.48 from Lowestoft running 20 late and I then caught up 37577 on the 11.10 from Peterborough seen leaving the A47 to go into Easton. The bus event also had an X1 connection, as on display there was 37573 supplied from Lowestoft garage. It probably didn't create a very cared for impression with its Easy Jet advert torn in half ! Met up with Michael Bryant and Sam and also finally made the acquaintance of blog contributor Jim Long. All in all a very pleasant afternoon, Gordon & Michael joined me on the open top VR to Lowestoft where sitting in the bus station was ..... 37577 which I'd left behind at Easton, waiting to work the 15.48 to Peterborough ! En route we also passed B7 37156 working the X2 on which it was joined by two Royales. Interestingly an email from Steve in Oulton Broad says that 37156 was actually at Gasworks Road garage at lunchtime and also parked round the back were 34108 and 37567. On my return journey, I encountered 37570 again, this time just leaving the A47 to take the Toftwood route dead on time at 18.22. Next was 37579 also on time with the 17.10 from Peterborough. Other services seen were 37562 on the 18.10 ex Peterbotrough and Michael reported 37574 on the 14.48 from Lowestoft. During the morning 37563 passed Walpole with the 08.30 from Great Yarmouth and going the other way was 37569 on the 10.10 Peterborough - Lowestoft which on arrival goes empty to Yarmouth. This only leaves one turn not mentioned and this was 37568 on the 09.30 ex Yarmouth. 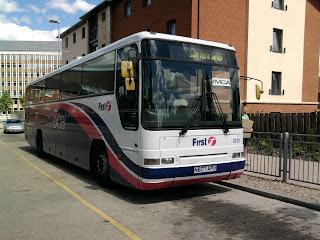 It was nearly 'The Beast' but a last minute change of heart saw it replaced by 568. Des very kindly tipped me off that he'd be driving K17 'via the correct route' through Wisbech this afternoon, so armed with camera I set up position on Nene Quay to get a picture. Result : somehow a great picture of the pavement. Fortunately Des himself managed a nice shot of 562 (for as usual that was on K17 today) at Peterborough. Let's hope I have more luck at Carlton Colviille tomorrow. 37575 is officially King of the Geminis. An eagle eyed traveller on Y7 reports it arriving at King's Lynn this evening with 202027 miles on the clock. Quite astonishing. I spent a little time at King's Lynn tonight viewing events. 37564 arrived 29 late on L11 and Y13 which should have been 37573 arrived about 15 late with 37565 which had earlier been on K14. Eastbound, Y6 was 37578 which arrived at 20.39 and departed at 20.46 as the 20.35 to Lowestoft. The delays were due to a major accident on the A47 Norwich southern bypass which saw some motorists and no doubt buses too, stranded in the searing heat for three hours. Earlier at lunchtime, 37564 was 12 late on L11 eastbound at Walpole and K15 with 37570 17 late going the other way. Seemingly unaffected by the riots, The Beast was one minute early on K1 15.48 Wisbech to Peterborough. When I took this photograph last night, I didn't know that it would be my last chance to picture this quartet together. 20109 & 20115 left today. It was almost the end of an era at King's Lynn today. 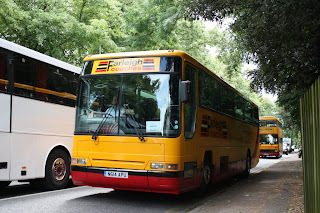 B10M coaches 20109 & 20115 departed, leaving just 20118 serviceable and with its MOT due to expire on July 18th. 20109 is already at Yarmouth for driver training and with withdrawn 20103 rumoured to now be at Norwich, it looks likely that 20115 may have returned there where it joins 20121. What does this mean for the X1 ? Well time will tell, may be Scanias plying forth to Peterborough and back once more in times of desparation? If so their tachos will need to be re-calibrated. 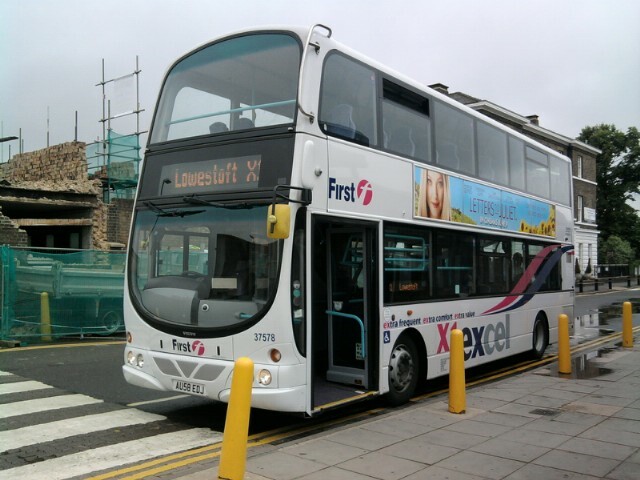 Out on the road today, 20107 took L10, seen by Bruce 23 late this morning and still 20 late this evening when seen at Tilney heading to Peterborough. Its super powers were in evidence though as it has just passed here heading back to Lynn dead on time ! This afternoon 37562 was as usual on K17 and with Des in charge took the correct route out of Wisbech ! Today 37564/7 were out of service at Lowestoft. 37158 seen last night with new fleet number after accident damage repairs. It has also swapped front panels with 37159, so it is now 158 without a 'First' branding on the front. ...and here is 37159 with its replacement front panel and new advert for Milk. The fleet of B9s are gradually approaching the 200,000 mile mark this week. Almost there if not already past this figure are 37572 & 37575 and not far behind are 37564, 37569, 37570, 37574 and 37579. Lowest mileage of the 37563 - 570, 37572-9 series is 37566 which has amassed a mere 179,000. 37576 is very slightly ahead of it. An interesting situation is in the offing as the warranty on these excessively high mileage vehicles expires in October/November. At the moment, as far as King's Lynn goes anyway, the garage holds no stock of mechanical spares for the fleet, so whether this situation will change remains to be seen. 20126 returned home to Yarmouth today on K18, but 20107 had an extended day as after working Y7 as predicted, it was called upon to relieve 37568 which had failed on K2. So having only just arrived from the coast, 'The Beast' then returned as the 18.35 to Lowestoft. Jamie R came over on L12 tonight with 37157 which is becoming louder by the day. Peter phoned to say that a friend of his had travelled on 107 today and sweltered in the heat as the air con was not working. I think the likes of 107 are almost pre air-con. A text from Bruce said it all this morning : K4 Beast Beast Beast !!! This was 107 on its second run of the day to Peterborough this afternoon. Yes it was just like old times today with King's Lynn allocating 20107 to K4 which should mean it will return west on Y7 tomorrow. The old girl was 23 late this evening heading for Peterborough and most other Peterborough bound services were also delayed. With 37564 & 37567 both spare at Lowestoft, it was surprising that Yarmouth coach 20126 was once again in X1 use on L10. 567 is thought to have been off for a scheduled safety service, but 37564 was expected to work. Just after lunch, B7 37156 was seen departing Wisbech on the normal route, but 14 minutes late on K16, yet 37562 on K17 (what else ?) following was dead on time. 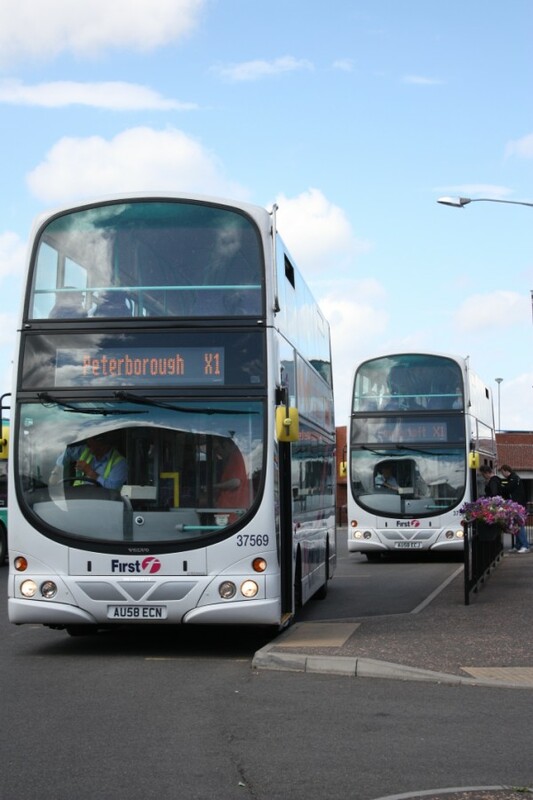 Bruce saw most turns again today, as many once again used the Churchill Road out of Wisbech en route to Peterborough. There was an unusual swap at Yarmouth this evening when 37579 working K15 back to King's Lynn was changed here for 37565 which had just come in on K1, about 20.15. 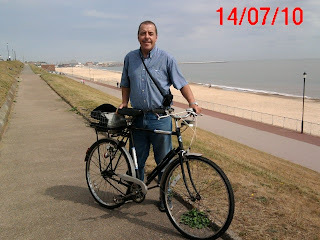 Syd says " The impossible has finally happened and 20107 is back at Lowestoft fully roadworthy and ready to go. Meanwhile 20103 has finally left Gasworks Road, but I am not sure to where...perhaps someone will confirm its new resting place. It was earmarked for Vulcan Road for spares". 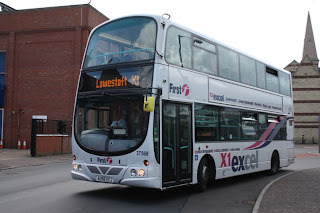 Well great news on 107, but what was unexpected was its immediate return to X1 frontline duty replacing Royale 34108 which had done the morning part of L11. This meant 'The Beast' was back at King's Lynn this evening. Bruce and myself managed to see all the X1 turns today with the exception of K14, which turned out to be 20126 ! 37566 must have had a lightning MOT, as it was back in action on Y13 today. 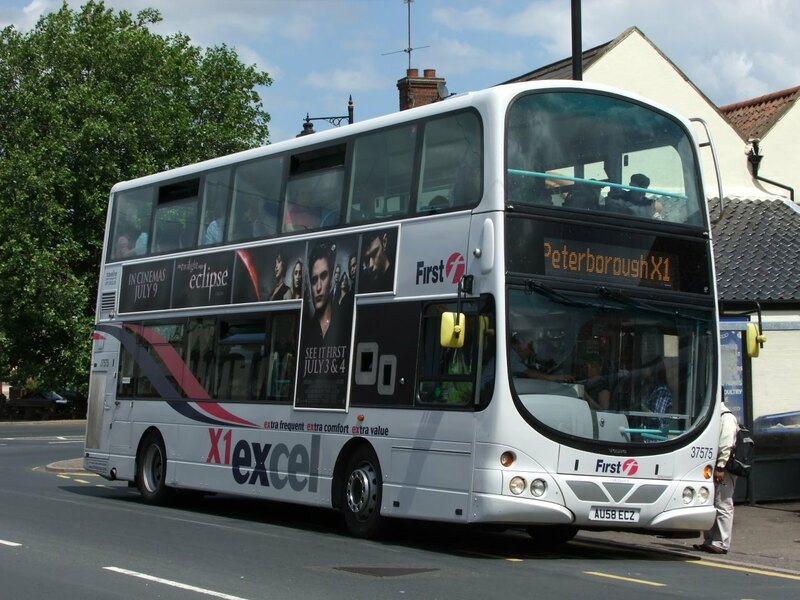 A few X1s travelled the correct route out of Wisbech today including Y7 with 37565, one minute early, Y13 with 566 likewise, K17 with 37562 4 late, K1 with 37569 5 late and K2 also 5 down with 37564. The unavailability of 37578 was the cause of L11 dropping to non low-floor power. Following our request for information on the whereabouts of 20121, Michael Bryant reports it in use in Norwich on Thursday last on the school contract normally worked by 20115 - no surprise there then, Lynn do the graft and MOT it and then we get 115 burning oil everywhere in exchange. The latter should just see out the last two weeks of Hunstanton schools before retiring. The fine weather brought out 20126 today, always noticeable by the large white area in front of the Excel branding. L11 heads east past Boskoop Farm today. An otherwise very normal day today was lit up by the reappearance of 20126 which mysteriously appeared on L11 this morning and proceeded to complete the turn which ends up at King's Lynn at 19.58. 37568 failed to appear today, so may be the coach was standing in for that. 37158 is still in bits in Vancouver Avenue at the moment, but 37159 was used on Lynn locals today. 37564 disappears eastbound as 37578 approaches on K16 west of Walpole Highway at 13.40 today. A fine study of 37575 at Acle today while working K1 11.55 Lowestoft - Peterborough. Photo : Grahame Bessey. 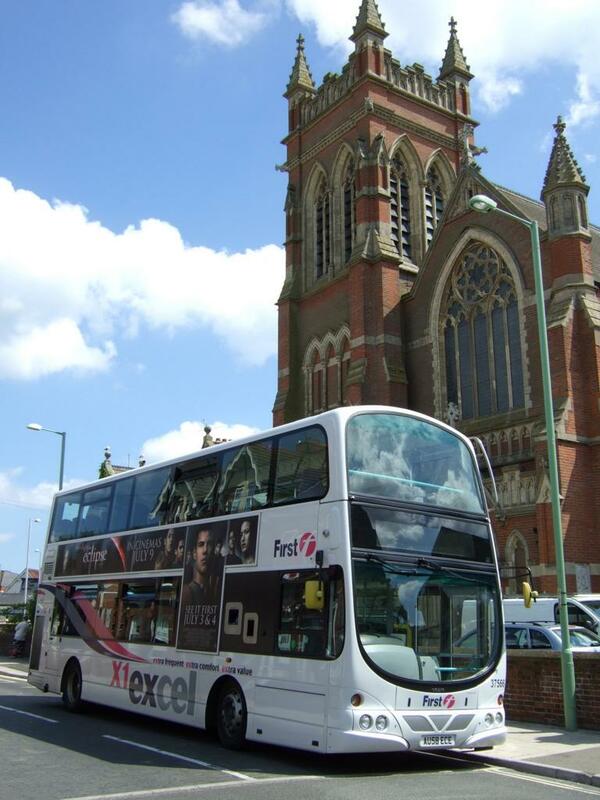 Another warm Sunday with several services suffering delays due to traffic. 37562, which apparently is still restricted to 49mph, was out and was noted at Walpole Highway 21 late on the 16.08 to Peterborough. Similarly, 37578 on the 16.00 Wisbech to Lowestoft was seen in Weasenham Lane at 16.10 running about 15 minutes behind time. 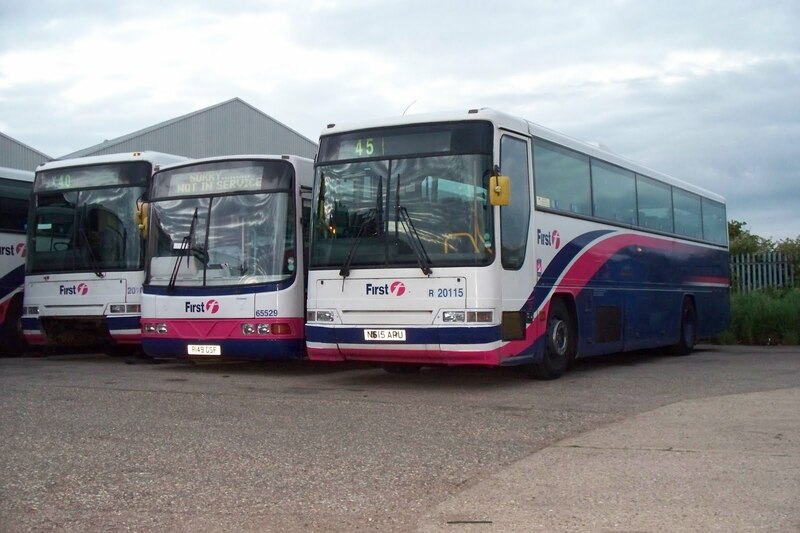 Thanks to reports from Bruce, Terence and Tony Irle we can give a complete log of buses used today : 37562/3/5/7/9. 37572/3/5/6/8. 37566 has been stopped at Great Yarmouth for MOT. Saturday July 3rd 2010 ~ Almost Ordinary ! Not much to report today. A low floor takeover was avoided by 20109 returning home on Y6 05.50 from Great Yarmouth, which it worked through to Peterborough before coming off the 09.35 return to Lowestoft at King's Lynn. It was subsequently sidelined with a charging fault. Its replacement was 37569. but this didn't last the day and was removed from the turn at Lynn at 20.27 being relieved by 37575 which had just come in from Lowestoft on L11. Other changes early on involved 37159 on Y7, off at Lynn at 08.37 and replaced by 37562. Elsewhere 37157 was working the 08.38 Lowestoft - Norwich X2. Maximum delay reported today was 10 minutes, though not all services were monitored. Friday July 2nd 2010 ~ Too Complicated ! A driver (well DS actually !) writes "What's this operating the 09.00 X1 ~ James Paget Hospital to Norwich ???" .... why it's 32208 !! 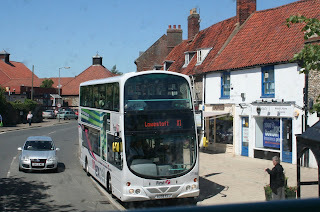 It also operated the 10.10 X1 ~ Norwich to Gt Yarmouth"
Fridays are always a fair bet for things to fall apart and due to an unfortunate A47 fatal accident near Narborough, which closed the road from 13.00 until tomorrow morning, today was no exception. Almost every turn changed vehicles - far too complex to even detail here, however, 20109 was involved. It began the day on K3, a King's Lynn internal diagram normally reserved for a B7 371xx, but due to almost everything slipping a turn, it ended up on K4 which finishes at Yarmouth. All other services were low floor Geminis but a quirk of the disruption was that this evening, all but one (to be confirmed of course !) Lowestoft B9s ended up overnighting at King's Lynn. This is unheard of under normal conditions and the day ended with the prospect of last arrival from the coast, K19, looking likely to be 37566 which would complete the set and leaving Lynn custodian tonight of 37562-70, 37572 & 37576, with 20109, 37156/7/9/60 all on the coast. 37158 arrived back at Lynn today largely repainted after collision damage repairs, but was off the road for servicing today. Will 20115 get out on the X1 now it is a Lynn based coach at last, or is it on borrowed time ? 115 rests at Rowan Road at 21.25 tonight. Yes it really was that late, photo courtesy of a.n. other. Knowing that Grahame Bessey would more than likely have some fots of the new Presidents, upon request he came up trumps with these two pictures, especially for us in the west of X1 land who have yet to see them. Above is 32208 at Hemsby on the 1a and below 32207 at Norwich yesterday on the X2. For the moment paper route numbers are sufficing ! Well we all got excited about the entry into service of 32207 on the X2 yesterday, but today it was out again and not only that 32212 worked the 11.38 from Lowestoft as well. Only problem was, it didn't come back and Michael says there was a 30 minute gap before the return of the 12.08 appeared with Gemini 37156. So may be a failure for 32212 ? For the first time since the partial closure of Nene Quay in Wisbech, there were three consecutive westbound X1s passing my window this afternoon. Firstly 34108 running 9 late on K16, then 37573 on K17 just 1 minute late and finally 37157 which was 8 late on K18. The next two took the A1101 route with 37578 and 37572 (K1) which ran 11 late. Proof that even 34108 can negotiate Nene Quay without incident ! Could this be the final appearance of the Royale on the X1 for a while ? 20109 continued to deputise for a B9 today working K3 and I am told by my man in the know that work is progressing well with The Beast and 20107 should be back with us shortly. Now here's a bit of non X1 related fun. 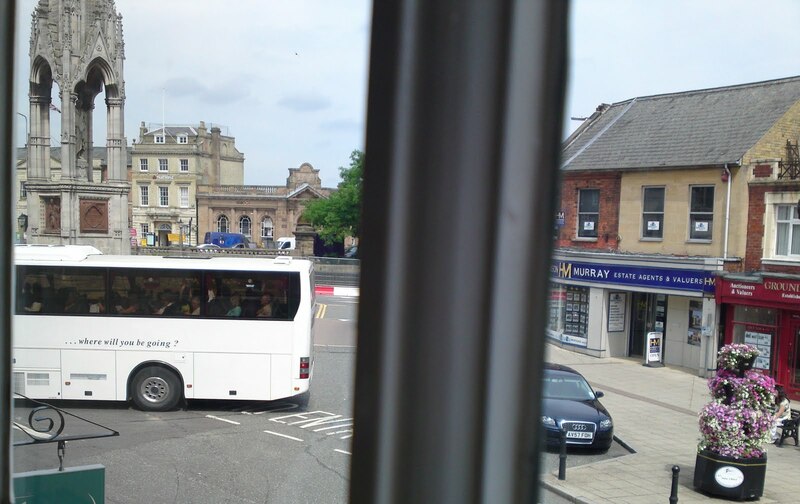 Cheryl sent this pic of a coach trying to deliver its load of passengers directly into Wisbech Post Office to collect their pensions. This week is the Wisbech Rose Fair and hoards of coaches descend on the Fenland town, many getting a bit lost in the process. We loved the legend on the side of this vehicle, very appropriate ! Yes sorry about the awful pun, but President 32207 made its debut on the X2 today with Michael seeing it on the 11.38 from Lowestoft. On the X1 some services suffered delays due to Royal Norfolk Show traffic. Worst was K17 with 37562. Peter & Angela were waiting for it on the 15.05 from Peterborough rail station and were disappointed to finally leave Peterborough almost an hour late. 562 was still 55 minutes down at Walpole Highway and hardly surprisingly was slotted into K18 diagram after this, taking it empty to Yarmouth. 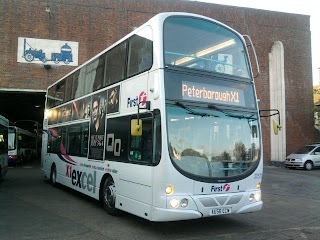 K18 never reached Peterborough at all and 34108 was instead diverted on to the Fairstead 42s. Tonight it was in Lynn garage. Lowestoft found 37568 to work the last leg of K17 back to Lynn. There was more fun with Y6 today, it was 37157 first thing, but somewhere along the line 37575 on Y7 overtook it and the two turns ended up reversed with 37575 going through to Lowestoft on Y6 tonight. Similarly this morning John W reports that Y9 with 37572 did not leave as the 09.45 Lynn to Peterborough and instead 572 was held over departing at 10.15 as L10 on which it replaced 37577. The latter was sent empty (to either Wisbech or Peterborough) and then ran on time as Y9. Yesterday 20109 was out on long turn K19 and today it had a service before doing K3, this due to 37576 being on MOT prep. King's Lynn were able to get rid of troublesome 37156 today on K14 and 37566 took over this turn after its lazy day yesterday. 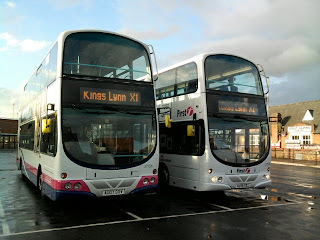 Two separate reports came to me today saying that all the remaining B10Ms at King's Lynn are due to be removed from duties here by the end of July. 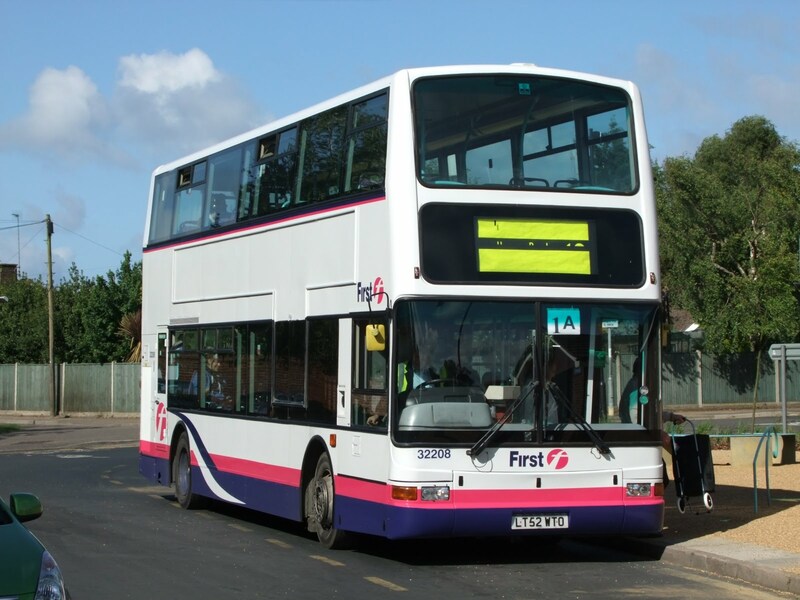 The three Hunstanton schools contracts which have been the mainstay of the work for the type, are from September, due to become double deckers with some routes being combined. 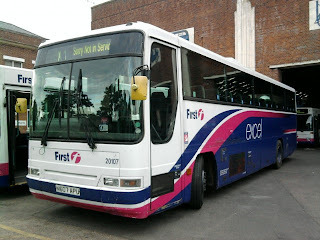 Apart from the frequent use as X1 substitutes, scarcely a day goes by without at least one B10M appearing on local services and after 16.30 quite often two are utilised in this way. This gives rise to the obvious question, what will be used in future ? 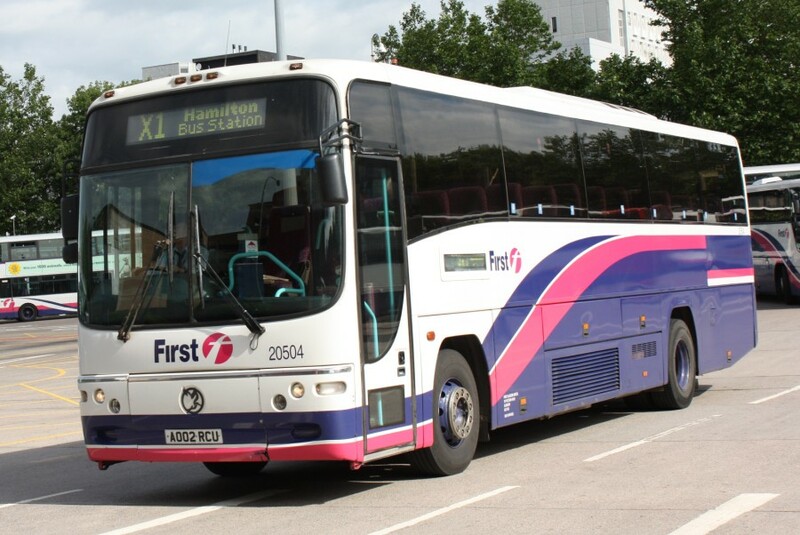 The arrival of 20115 has a sting in the tail, 20121 which passed its MOT last week has departed and some are saying that it could well be destined for future use as a driver trainer. More news as we get it. 37566 continued working on the X2 today and was seen by MB on the 08.08 from Lowestoft. K3 had B7 37160 to begin with, but at some point (either at 09.32 or more likely 16.15), repaired 37156 was given a test run and took over. Thanks to one of our regular correspondents for the news that 37563 suffered a broken top deck front window en route to Lowestoft on K1 and 37157 replaced it for the 11.55 to Peterborough. 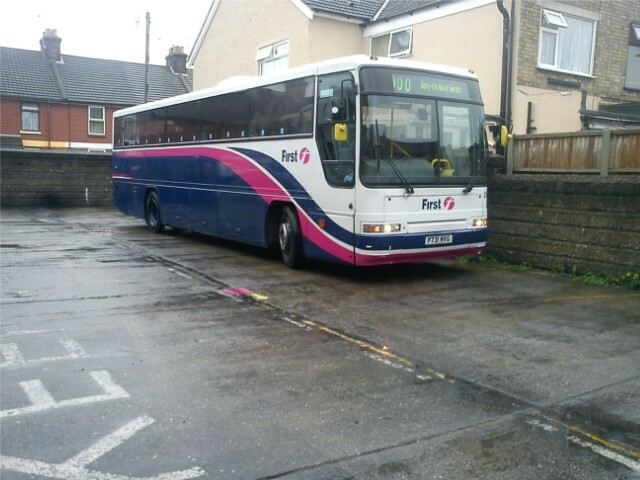 563 was repaired at Lowestoft then made its first foray onto the Bernard Mathews contracts in the afternoon. It was then used on the 1810 and 2110 service 1 to Martham...but failed in Gorleston on the second trip with an air problem. Amazingly it was replaced with 37573 (Gt Yarmouth Engineers may have thought it was on X1s) which continued to Martham and then back to Lowestoft, before being collected by the Engineers and running back to Caister Road light. Meanwhile 37563 was towed back to Lowestoft where its bad luck continued and it sustained collision damage. Another B9 off the road now is 37576, this one is at King's Lynn for MOT.